Full memorial designs with kerb surrounds. 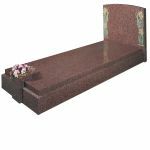 Certain cemeteries still permit a full covering of the burial plot with a memorial of this traditional design type. The headstones are generally fitted to the kerbs or mounted upon a block at the head of the grave. Kerb lengths will be determined by the overall grave size. All memorials are built upon a reinforced concrete foundation, these can be solid or frame depending on regulation and religious requirements.